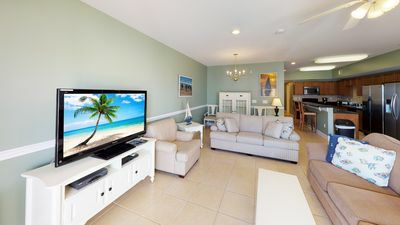 After vacationing and enjoying the Coral Beach Resort for years we were thrilled to purchase a unit eight (8) years ago. 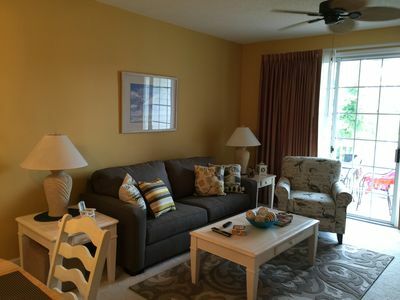 We have removed our unit from the Coral Beach rental program to have more freedom to better upgrade and manage our unit. 2019 Renovations!!!! 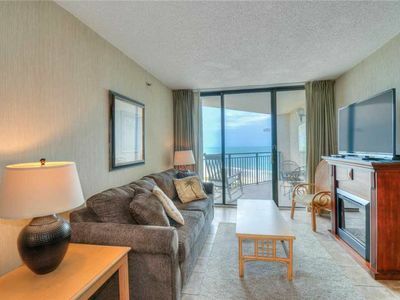 Looks like a beach condo and not a hotel room! Gorgeous upscale luxury vinyl waterproof plank flooring. NO MORE DINGY, STAINED CARPET!!!!!! New queen beds in bedroom, new Laz-y boy sleeper full size sofa, all new linens, whole unit painted- walls and trim, new hardware throughout. Bathroom is stunning with newly shiplapped walls. EXTRA STORAGE!!!!! Built-in Wall unit in bedroom to accommodate guest's clothing. Suitcases can now be stored under the beds and out of the way! Will post pictures when work is completed! 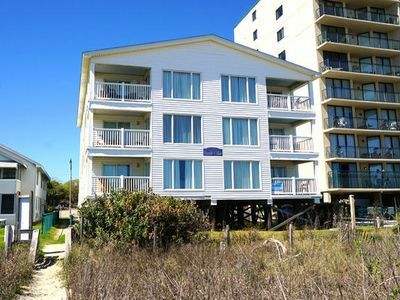 Unit sleeps 6. 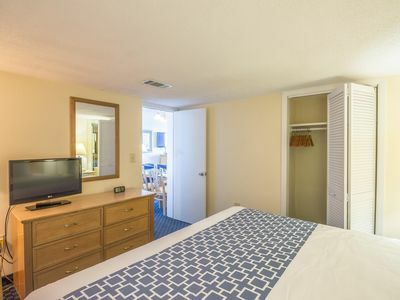 Bedroom has 2 Queen Beds and Front Room 1 Full Murphy Bed with door which closes for privacy. 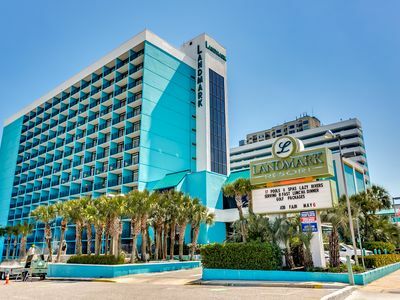 You will enjoy the wonderful water amenities: 10 Pool Attractions (including): Children's interactive water park with zero entry, submarine & shipwreck and other fun stations, large outdoor pool, 2 outdoor kiddie pools lazy river, outdoor jacuzzi, indoor heated pool and 3 indoor jacuzzis. Fun for all ages! 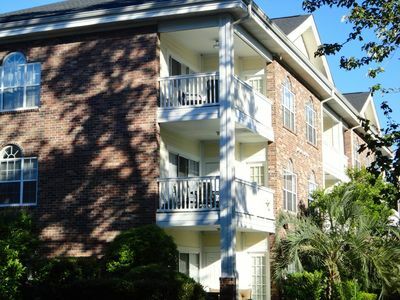 We think you will love the newly renovated condo. Our kitchen is stocked with high end: Wolfgang Puck pots and pans, crock pot, full size coffee maker, Ninja professional blender, dishes, and flatware. We just installed all new hardwood cabinets, granite counter tops, Bosch dishwasher and new refrigerator! We have added a separate shelving unit to store your food items. Everything you will need in the kitchen is provided! 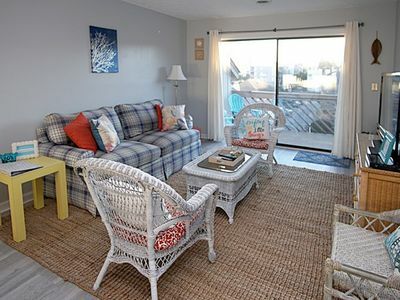 We spend a lot of time at the beach and we know what you need! 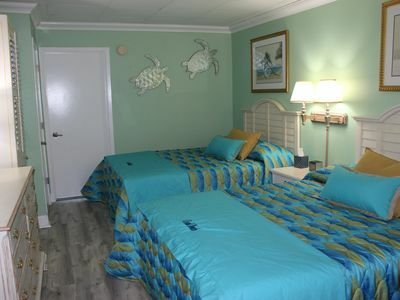 We want to make you as comfortable as possible during your stay. We want to keep you coming back! We have installed an in-suite LG quiet, combination washer and dryer, which is located under the bathroom counter for your laundry needs. 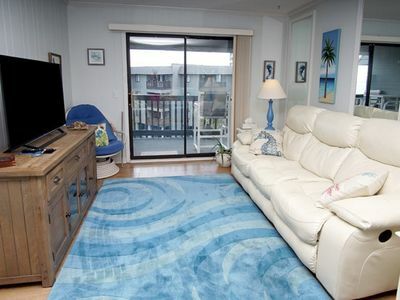 Our Unit is very 'family friendly', we have two children ages 17 and 20. There are 2 flat screen T.V.s, board games, 2 DVD players, atari video games, sony play station with games, books, movies, and wheeled cooler. 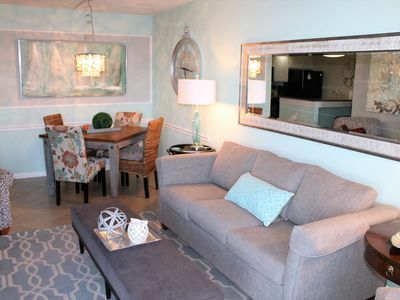 We only ask that you treat it gently so the next guests can enjoy! 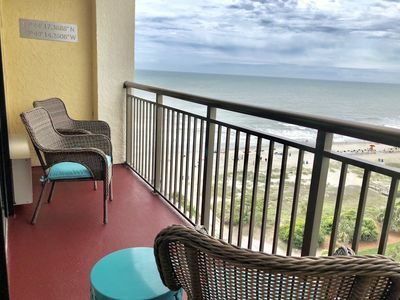 Our unit is very conveniently located in the lobby with a beautiful ocean front view. 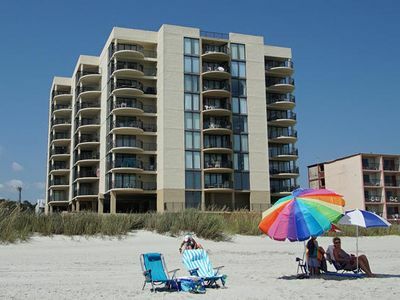 We are only steps away from the pools and beach, eliminating any use of elevators, thus no long waits! 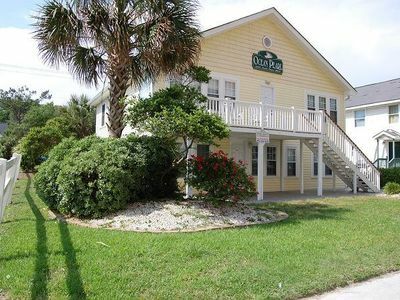 Sandbunkers Beach Bar and Grill is located on the ocean front patio which in-season provides live entertainment daily and family fun karaoke most nights. Our children have been singing karaoke for years, you may know them as the brother/sister 'Love Shack duet!' You may listen to the bands, BUT YOU WILL NOT BE ABLE TO PURCHASE FROM BAR. 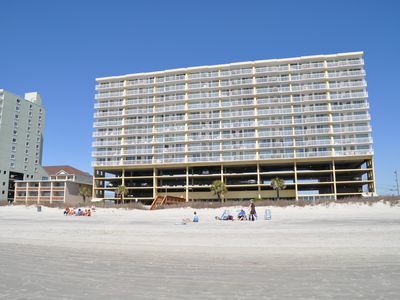 The Coral Beach Resort is centrally located to many attractions in Myrtle Beach. 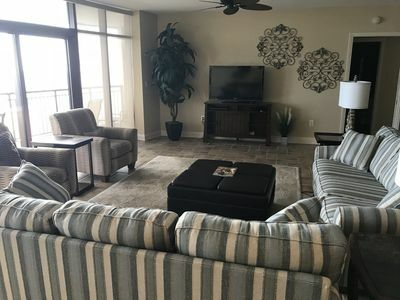 You are in walking distance to Family Kingdom amusement and water park and a 10 to 15 minute drive to the following: Market Commons, Broadway at the Beach (something for all ages, specialty dining, shopping, attractions and aquarium), Tanger Outlet Mall (off 501, over 100 stores), 115 golf courses! We used CBRM (Coral Beach Resort Management, the exclusive on-site rental management company at Coral Beach Resort) for the 5 years. 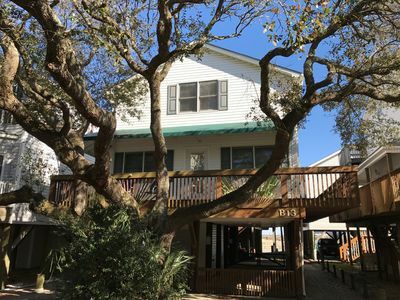 Due to the decline in the economy and losing almost 2/3 of our property value it became necessary for owners to seek more competitive, third party management companies or self-manage their units in order to exist in this economy to meet expenses. the fitness center (We have arranged for you to go to Core Fitness Club, 1141 Robert Grissom Parkway, 2.8 miles away for $8/day, 14,000 square-foot facility features cardio and strength machines from Life Fitness, as well as Hammer Strength plate-loaded equipment,as well as exercise classes). the Restaurant, we have only eaten there once in 5 years. 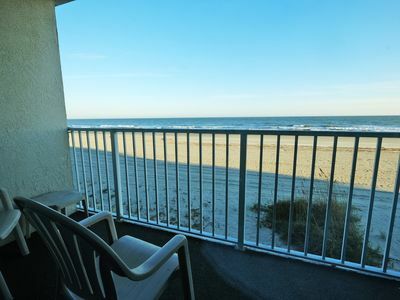 We assure you it will not prevent you from having a fabulous, beachfront time! 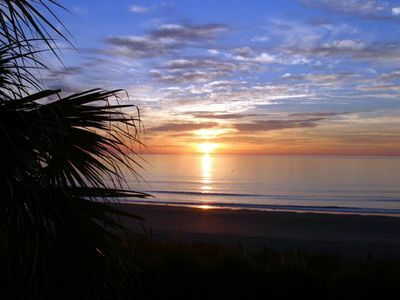 Go, enjoy all the water activities, listen to music, and have a great time! CBRM has implemented, 'the Splash Pass'. Cash is no longer accepted and only the guest of CBRM will be issued these 'splash passes.' Ladies and Gentleman they have just offered you and your family 'vacation protection' from overspending at the Coral Beach Resort. You will not have to worry about any large bills at checkout. I think we can all agree, these scenarios with only card charging, can completely spin out of control on vacation! 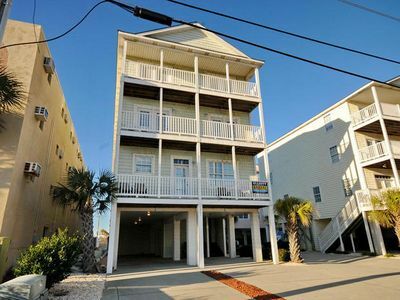 Oceanfront 3 Bed/3 Bath Condo in Cherry Grove!! 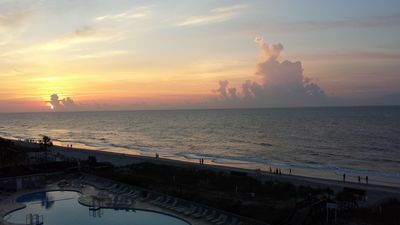 Sands Beach Club (#123) Two Bedroom Ocean Front Condo!! !